Donald Trump Wants To Make U.S. Energy Great Again Since 2012, the U.S. has produced more oil and gas than any other country even as solar and wind power have also experienced huge growth. 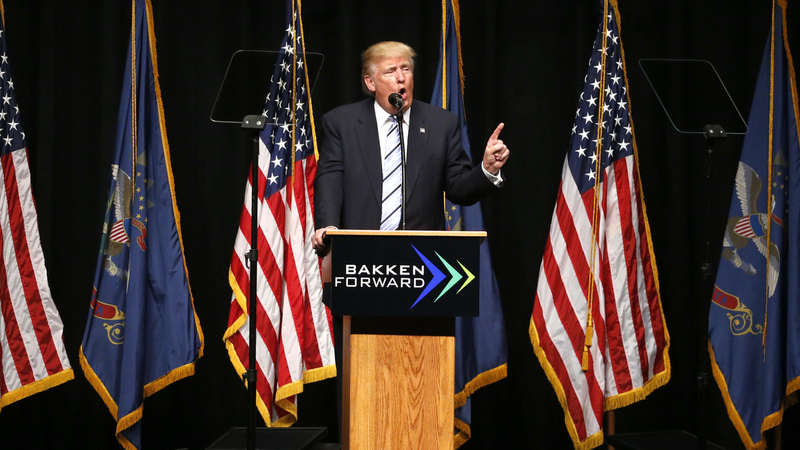 Donald Trump lays out his energy agenda at a press conference in Bismarck, N.D.
Donald Trump marched through the Republican presidential primary field this year on the strength of a focused message: America used to be great. It isn't anymore. And that's mostly the fault of the Obama administration. On Thursday, Trump applied that same thesis to American energy production. "America's incredible energy potential remains untapped," he told a North Dakota audience in what was billed as a major policy address. "It's totally self-inflicted. It's a wound, and it's a wound we have to heal." The problem with Trump's analysis: It comes at a point when, judged solely on production numbers alone, American energy production is, well, pretty great. Every year since 2012, the United States has produced more oil and natural gas than any other country. And it's not just fossil fuels that are on a roll; the amount of electricity generated by wind and solar energy has also soared in the past decade. The domestic oil and gas boom has been powered by hydraulic fracturing, a controversial drilling technique that uses water, chemicals and sand to blast oil and natural gas out of shale rock deep below the ground. While the oil and gas industry has seen a steep decline lately — which has led to industrywide layoffs and retrenchment — it's largely a victim of its own success. A glut of domestic oil and gas has caused prices to drop, leading to a slowdown in production. Still, Trump said American energy production can do much better. He promised to scale back federal regulations, lease more federal land for drilling and revive the struggling coal industry. "We are going to turn everything around," he told the Bismarck crowd. "We are going to make it right." Here's what Trump had to say about four key portions of the energy landscape. Fracking is largely regulated on the state level, but the Obama administration has attempted to tighten rules for the procedure when it occurs on federal lands. Trump promised to scale back energy regulation on all fronts. "Any future regulation will go through a simple test," he said. "Is this regulation good for the American worker? If it doesn't pass this test, the rule will not be approved." He warned that Hillary Clinton, by contrast, would "escalate the war against the American worker like never before, and against American energy. And she'll unleash the EPA to control every aspect of our lives, and every aspect of energy." In a press conference before the speech, Trump said Clinton would "ban fracking." That's not true. In fact, her Democratic opponent, Sen. Bernie Sanders, has run ads against Clinton blasting her for supporting the drilling technique. Like Obama, Clinton has embraced natural gas as a "bridge fuel" that, while flawed compared to wind and solar energy, is cleaner to burn than sources like coal. During Clinton's tenure as secretary of state, the State Department tried to drum up support for American drilling technology overseas. As a presidential candidate, she has taken a much more cautious approach, calling for increased regulation of fracking. During a debate this spring, Clinton said she would support the technique only when local governments approve, when the drilling isn't leaking methane and when companies disclose the chemicals they are using to frack. "So, by the time we get through all of my conditions, I do not think there will be many places in America where fracking will continue to take place," said Clinton. PolitiFact has the full details on Clinton's history with fracking. Trump blamed the Obama administration for a drop in drilling rates. It's true that drilling has fallen off lately and there have been widespread layoffs in Pennsylvania's Marcellus Shale formation and other regions where fracking had taken off over the past decade. But again, that recent downturn is due largely to supply and demand, not regulation. As prices for oil and natural gas have plummeted, energy companies have slowed production. Donald Trump is vowing to save the coal industry. He donned a miner's hat during a recent West Virginia rally. 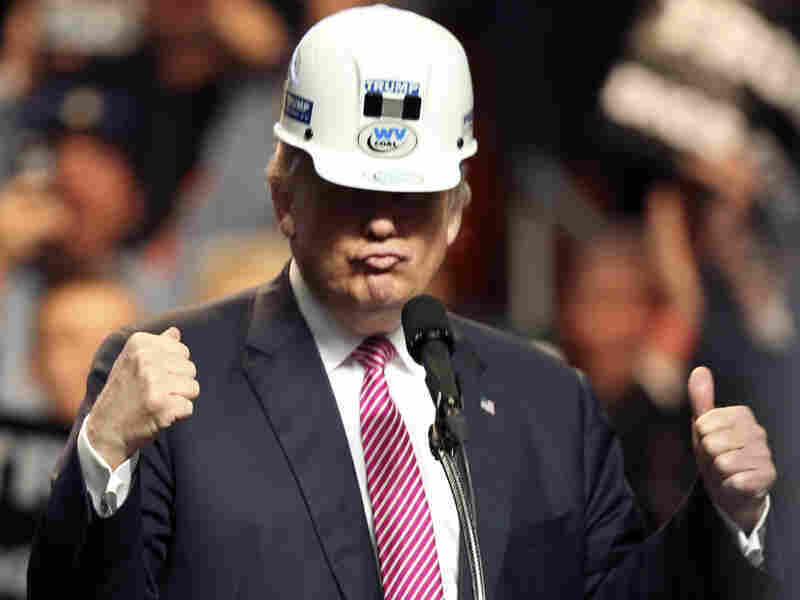 Trump bills himself as a savior of the coal industry. "We're going to save the coal industry, believe me, we're going to save it," he said. Coal production has dropped precipitously in recent years. Major coal companies are declaring bankruptcy. For years, Republicans have blamed the industry's problems on what they call the Obama administration's "war on coal." There's no question the White House has been tough on coal. A central part of the country's plan for the Paris Climate Accords — more on those later — involves shifting energy production away from coal-fired power plants, and toward natural gas plants and renewable energy. The EPA has made it harder and harder to build new coal-fired plants. While a coal plant pretty much has to run all the time, a gas plant can be shut down and fired back up more easily to meet regional electricity demands, according to Dave Meehan, head of Sunbury Generation, which owns the site where the new plant is being built. It's easier on the environment, too. There's no coal ash to deal with, it uses less than 5 percent of the water for cooling than the coal plant used, and it emits less pollution. Here's the real kicker: The new gas plant will produce more than twice as much electricity as the old coal plant — enough to power about a million homes. "Gas is taking more and more market share from coal, and that's a reality that is here to stay," Meehan says. So it would be very hard for Trump to simultaneously increase oil and gas drilling and revive the coal industry. Trump only made tangential reference to climate change during his speech, calling Obama's climate regulations "draconian" and vowing to "cancel" the major climate change agreement that the United States and other countries signed onto in Paris last year. Like many other Republican presidential candidates this year, Trump has previously dismissed human-induced climate change as a hoax. "The concept of global warming was created by and for the Chinese in order to make U.S. manufacturing non-competitive," he tweeted in 2012. Trump blasted the United Nations Paris agreement, where the U.S. and other countries vowed to gradually lower carbon dioxide emissions to try and limit the global warming that's already underway. The U.S. would try to accomplish this by shifting power generation away from coal and toward renewable energy like wind and solar power, as well as natural gas. "This agreement gives foreign bureaucrats control over ... our energy, and how much we use, right here in America," Trump said Thursday. "So, foreign bureaucrats are going to be controlling what we're using and what we're doing on our land and in our country. No way." Not exactly. It's up to American bureaucrats to enforce the agreement within the United States, though that's likely not going to make Trump and other opponents feel much better. The main thrust of the U.S. Paris plan is an EPA rule called the Clean Power Plan, which would lower the power sector's carbon footprint by more than 30 percent. That plan is currently in limbo, though. The U.S. Supreme Court has blocked its implementation until judges have a chance to rule on whether the EPA has the power to impose such a major change. That means a President Trump could have a chance to scuttle the rule before states begin to implement it. At a press conference before his speech, Trump said he supports "all sorts of energy," including wind and solar panels. But he wasn't exactly heaping praise on the two alternative energy sources. "The problem with solar is it's very expensive; wind is very expensive," he said. "There are some places in California, wind is killing all of the eagles. You shoot an eagle, you kill an eagle, they want to put you in jail for five years. And yet the windmills are killing hundreds and hundreds of eagles ... so wind is — it's a problem." "But despite that," Trump added, "I am into all types of energy." There's no question turbines can be dangerous for birds, including eagles. So can industrial-scale solar farms. But the American Wind Energy Association calls turbine-linked eagle deaths "exceedingly rare." Wind power has been growing at a rapid rate in recent years, as NPR has reported.